We loved the size of the campsites at Fair Harbor. 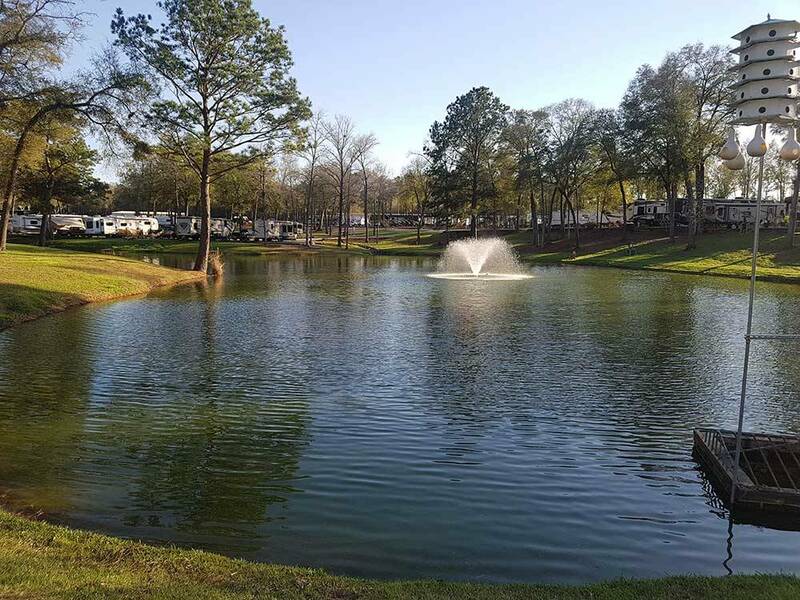 We have a 43’ motorhome and tow a vehicle, and it was easy to maneuver and to get in and out of this park. We would stay here again when in South Georgia. Stayed overnight while traveling. Easy access from highway, friendly staff, spacious sites. Would use again. Thanks for your kind words. Hope to see you often. Stayed here on our way home in our 40' Class A coach. Site was pull through with gravel. Had a little trouble getting level but good hookups and close to washrooms that were very nice and clean. Dog walking was good with lots of green space. The park was very full during the stay for an event at the agricultural center (horse show?) but didn't feel cramped. Staff was very friendly and helpful getting our reservation sorted out. We make an online reservation and they didn't have it when we arrived but did find where we had paid in advance so it worked out. Would definitely stay here again. This is one our favorite transient stops while traveling to or from Florida. It is close to I-75 and the staff is always very accommodating. Late arrival is no problem. Great place for our big Labrador too. Nice clean sites that are big rig friendly. Always a good experience. GREAT RV CAMPING! Sites were large, great location, open area for walking, campers with horses were allowed (saw some great looking horses). It had 2 dog park off-leash pens... YEA! Most only have 1 small. It was friendly people, clean facility, and beautiful rolling area with ponds, goats (penned) , and plenty of life. Loved our stay here. We're glad that you enjoyed your stay here and yes, we like our "4 legged guests" to enjoy their stay here as well! :-) Hope to see you again sometime! 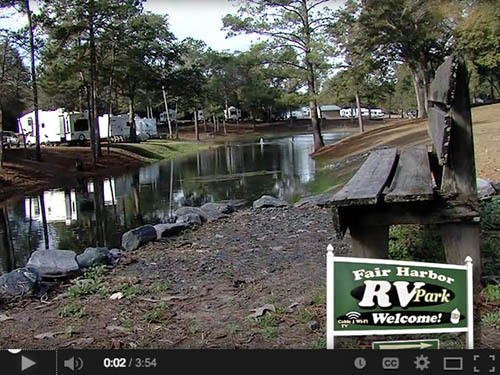 We stopped at Fair Harbor RV Park & Campground for a one night stop in route to our next destination. We had made advance reservations and showed up after the office closed. Our lot and park information was waiting for us upon arrival on the door (as was that of a few other late travelers). They left a detailed map and our lot was very easy to find. The park was clean and well groomed. Very aesthetically pleasing with a good amount of grass, trees, even ducks wondering around and a field with goats to watch. Had a great National Park feel to it. Had a small lake by our site which added to the aesthetics. Wi-Fi was good and free for basic speed, they do offer a premium servie with a higher speed at $4.95 per day but being we just stoped overnight did not opt for this. The park does have cable TV, just connect the cable which is located on your power hookup pole. We would most definitely use this as another rest point or maybe a longer stay in the future, as we love this area. We no sooner parked our coach and several other campers came over and offer any help setting up (nice)!!! We did talk to several of them and they all praised the park, and fro our experience we agree with them. Upon calling for reservations the staff was very friendly and made us feel that we were truly welcome. You're welcome here anytime! Glad that your experience was pleasant and hope to have you back soon! My husband and I are new to RV-ing, having always been pop-up campers. This was our first RV Park. Very clean, great service, quiet, and convenient. We thought this was a great place, just not our style. We didn't care for - lacking a better term, "stacking" of RV's. There is no space between sites. All in all, if we find ourselves down that way again, we would consider revisiting this park. We thank you for your feedback! If you do find yourselves this way again, feel free to let us know you'd like a more "spacious" site (as we do have some with more "elbow room") and we'll do our best to place you in one of those. Hope to see you again! Very nice park with all amenities, ,,, EXCEPT ADEQUATE INTERNET SERVICE. CAMP LIMIT IS 1 (THAT'S ONE GB PER DAY) AND THAT HAS BEEN REDUCED TO DIAL UP SPEED. IF YOU WANT NORMAL (PREMIUM ) SERVICE, YOU MUST PAY $1 PER HOUR IN 3 HOUR INCREMENTS. We are full timers and have never seen this policy anywhere. Spotty service is even better than this!!! BE AWARE. THIS INFORMATION IS NOT COVERED IN PARK BROCHURE OR WEB SITE. Rates are good if you don.t mind lack of internet speed. Thank you for your feedback. 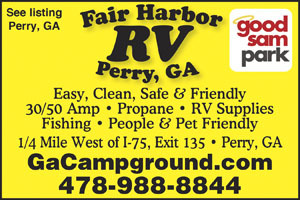 Internet service is a difficult thing to provide seamlessly at an RV park as large as ours. Not an excuse, just an explanation. We have so many devices using our system every day that we have to limit usage to give everyone at least some level of service. We continuously strive to improve the system and customer satisfaction. That is important to us. Admittedly, the free service is not as fast as the paid premium service and even the premium service does not work perfectly all day every day. That's just the nature of wireless internet service. Also, the paid service is not $1 per hour. It is $4.95 per day or $14.95 per week. If you'll let us know next time you're here we will give you a complimentary wifi voucher. Hope to have the opportunity to do so.